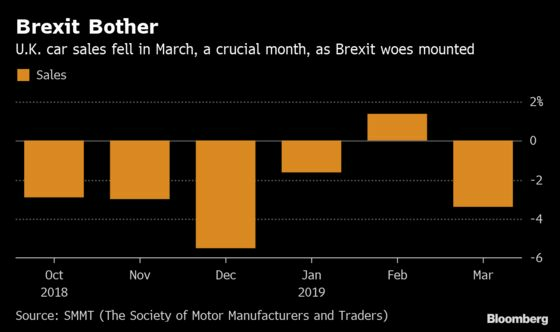 (Bloomberg) -- The approach of Brexit and concerns over the future of diesel vehicles pushed demand for cars in the U.K. to a six-year low last month. Sales dropped 3.4 percent year-on-year to 458,054 passenger vehicles as consumers stayed away from showrooms during what’s usually a strong month for new purchases because of a number plate changeover, the Society of Motor Manufacturers and Traders said. The U.K. government’s ongoing battle to find a way out of the impasse over Brexit, originally scheduled for March 29, is hurting consumer demand in a number of corners of Britain’s economy. EasyJet Plc warned this week that it was expecting a weaker summer travel season, while shares of cruise and tour provider Saga Plc fell 38 percent Thursday. It partly blamed a drop in travel bookings. As well as Europe’s second-biggest car market, the U.K. is also the continent’s fourth-biggest vehicle manufacturer with companies like BMW AG, Jaguar Land Rover and Toyota Motor Corp. and their suppliers reliant on cross-border supply chains and tariff-free access.